I cannot remember the last time I wrote anything to help us students out but I don't know about you, but I'm really not looking forward to going back to University in just over a week's time for semester two of my second year. 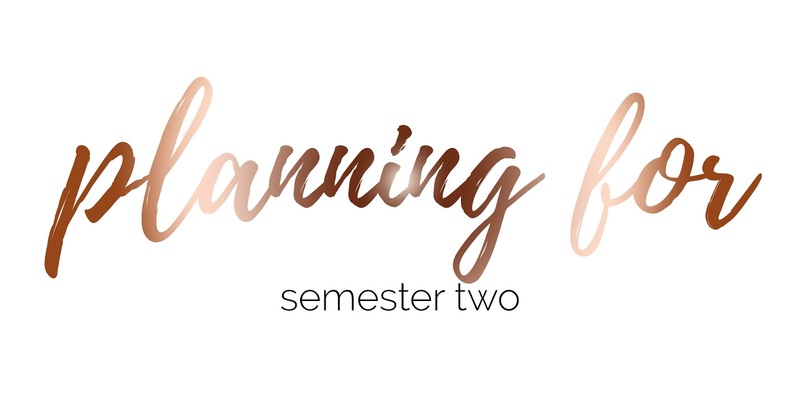 However I thought this would be the perfect opportunity to share the ways in which I plan for the semester which is coming up very soon! I have to say this is what I usually do when planning for each Semester, and I do still want to do all of this; but whether I'll actually do it or not is a completely different question. Maybe this will be the push to make me do it? Who knows. 1. Take any books back to the library and find relevant ones for your new module. This is something I desperately need to do however I can't do it without going with my friend as she has some of my books! But one thing I like to do is take any books back to the library from the previous module and to then take out any new ones for the relevant upcoming module. We're only allowed to take out 20 so I try to find as many as I can and then I buy the rest off Ebay for cheap prices. 2. Print off your module guide and start reading! Another thing I like to do early on before going back to University is printing off my module guide and to start reading it and highlighting different parts of it which are the most relevant. However, my tutors are getting more and more unorganised so with a week to go till University, we still haven't received them! 3. Take notes on your module guide. I'm not sure if everyone does this but I know this stage of prepping really helps me! For some reason information only goes into my head if I write it down. So rewriting a whole page in my own writing will help me to remember what I need to be learning about, instead of just reading the module guide once. I don't know why I have to do this, but it works for me! 4. Read through your new uni books and start placing page markers! I've recently found this part of prepping for University so much easier when it has come to writing up essay's and presentation's as it saves time looking for the information in books! If you've read your module guide then you'll know exactly what you're going to be writing about in your essay's/presentation's, so you can then start looking through your books, finding new information and placing page markers on these pages so you can easily go back to them without hunting through the book for the seventh time in a month. Last but not least you're going to need to do some research online! Find websites, journals, e-books; anything which might be useful to you when it comes to your write up! I end up with at least 30 tabs on my Internet browser from where I've been researching but make sure you bookmark them first into a folder! You don't want your laptop to update and to then lose everything you've found already. Have any of you gone back to University yet after the Christmas break?